For the second layout this week, Kenny and his team have created a fabulous Makeup Artist Layout Pack. This layout pack is trendy and professional at the same time which makes it a perfect fit for any beauty, health or skin care website you want to create. 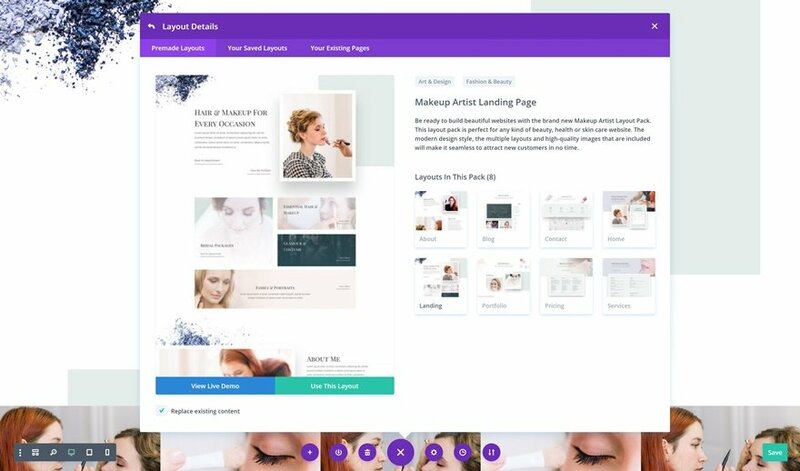 Be ready to build beautiful websites with the brand new Makeup Artist Layout Pack. This layout pack is perfect for any kind of beauty, health or skin care website. The modern design style, the multiple layouts and high-quality images that are included will make it seamless to attract new customers in no time. The layout looks really nice. Too bad the blog page has to be soooooo bland compared to the rest of the pages. Oh boy…you hit a nerve. I spent the last 2 days trying to get a decent looking blog page and ended up buying a layout. Divi isn’t taking the import of the layout and I’m frustrated as heck. I’d like to see more development of Divi than more layouts. And if designers are working on these, I’d rather get unique sections rather than full layouts. +1M on blog. It’s mind-blowing that Divi still has this massive hole that ET just won’t address. Why put out two beautiful layouts every week when you can’t even work out how to provide a way for your customers to theme the blog/post/archive pages? Is it really that hard for all of your team of techs to figure out? If any of my clients want a blog – I can’t even bring myself to recommend Divi and have to purchase another theme or builder. It’s just not worth the extra hours and effort for something that should so obviously be part Divi already. As a Newbie, I just realized that Divi doesn’t put the titles and Alt tags on images—I now have to go through a few hundred pages and add that —not easy. I use the builder on the backend and it’s very tedious. Slow as waiting for water to boil. Yet we get another layout? Last week we got a car rental agency layout—now that’s one we’ll use every day. Ugh. I love these guys at ET but Divi takes a ton of patience. Hi Tim, it’s perfectly possible to style category, archive and single pages, just add a child theme and add some css style to style your pages to look like your blog page. To be fair, that’s what Extra is for. 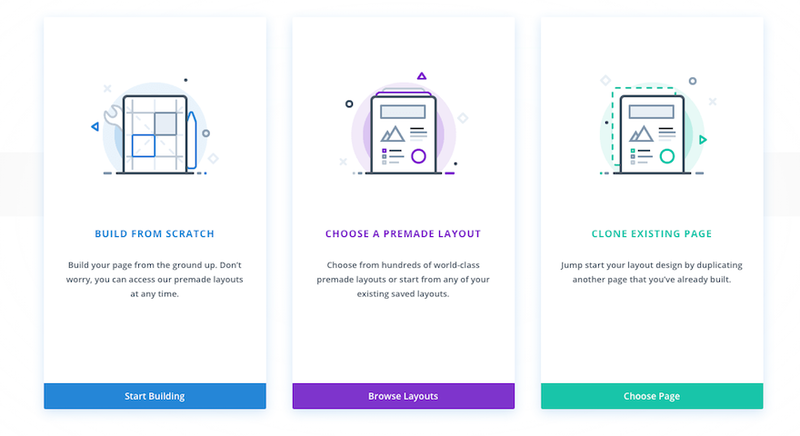 Extra has the Divi builder + archive page design options. I really cannot see why people continue complaining about the lack of blog options for Divi when Extra exists. Offer still available without requiring credit card? Nice one 🙂 I appreciate the time & effort that was put into this! Great layout! Clean, fresh. Me like. Thank you. Keep up the good work. Good one! I appreciate the time & effort that was put into this! Like Divi alot, but the “free layouts” aren’t free if you can’t get them to load. I’ve changed the file upload and memory allocations, but premade layouts never load – they just spin. They used to offer then in zip file, but now they’re all crammed into the Visual builder. 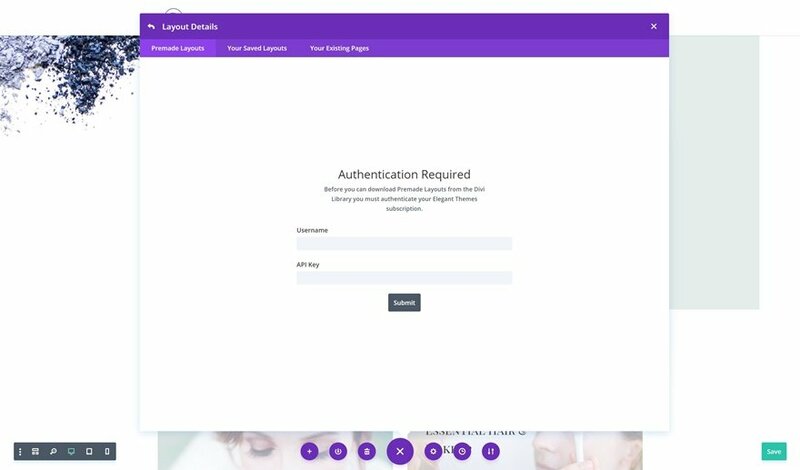 Why not include these layouts on the Downloads page inside the login area? I can choose the one I want – instead of bloating the theme with the other 59 that I don’t need?